Just because you want to share a video with someone doesn’t mean you’re eager to share it with everyone. That’s the motivation behind Givit, a private video-sharing service with its own Web-based client and now an iOS app. Givit announced its universal iOS app earlier this week. Givit for iOS offers the same functionality as the service’s website. You can upload videos and—in just a few steps—invite other people to watch the clips stored securely on Givit’s website. Givit is a Web-based service that lets you share videos with select people instead of having to fiddle with privacy settings. True, similar services offer varying degrees of privacy. YouTube, for example, lets you adjust your settings to keep posted videos out of the public eye, while Facebook also allows you to set who can see a video posted to the social networking site. The difference, says Givit CEO Greg Kostello, is that his service is inherently private. That, in turn, should appeal to the non-technically-inclined audience that Givit is hoping to attract. “We took away options until we distilled video-sharing to the simplest way to do it,” Kostello said. “It’s amazing when things become simpler how frequent people use them,” Kostello says of the philosophy behind Givit’s approach. I spent a little time with Givit’s iOS client, and it certainly hews closely to the company’s vision for easy video sharing. You can sign up for Givit from within the app. All you need to do is enter an email address and password; you can also sign up through Facebook. On the iPad, the Givit app more or less resembles the website’s interface. Things are a little more stripped down on the iPhone because of that device’s more limited screen real estate. You can either shoot video from within the Givit app or select a video that’s already stored in your Photos library. Once you’ve shot or selected a video, you simply enter an email address—the app can access any contacts stored on your iOS device—add a message, and tap send. Preprocessing and uploading a video can take a little bit—a one-minute video of my daughter took about seven minutes to upload over Wi-Fi. (Uploads from my MacBook Pro via the Givit website were far speedier.) After everything’s done, you’ll get an email confirmation that your video was shared. You’re able to add other recipients even after a video has been uploaded. In my testing, recipients got their email notification right after I added them; I didn't have to tap the share button again. 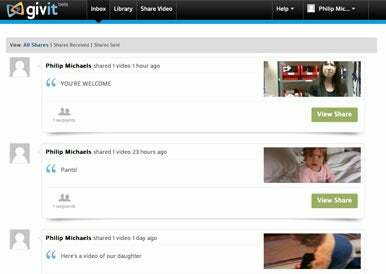 You can also revoke users’ ability to see videos you’ve previously shared with them. Givit is a free service, and the app is a free download. Kostello tells me the plan is to adopt a freemium model for Givit, where users will pay a monthly or annual fee for permanent storage. It’s easy to see Givit’s appeal to parents who’ll leap at the chance to easily share videos of their kids with far-flung friends and relations. But Kostello believes Givit’s focus on private sharing makes it attractive to other users as well. Athletes could share videos with coaches that might serve as good training aids. Businesses could also use the service to privately share videos with clients. You will need a reasonably current Web browser to use Givit. The service supports Firefox 5 and later, Safari 3 and later, and Chrome on the Mac.